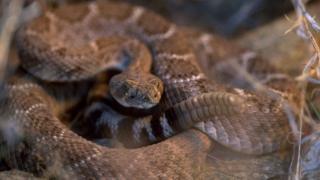 A Texan required 26 doses of anti-venom after he was bitten by the severed head of a rattlesnake he had killed. Jennifer Sutcliffe told local station KIII-TV that her husband Jeremy was working in the garden when he saw the serpent and decapitated it. When he picked up the snake's remains to dispose of them, the head bit him. A snake's bite reflex can be triggered up to several hours after it has died. Ms Sutcliffe told KIII-TV her husband immediately began to have seizures. The couple were weeding in a flowerbed at their home near Corpus Christi when they came across the four-foot (1.25m) Western diamondback rattlesnake. He was airlifted to hospital where he was treated with the anti-venom CroFab. More than a week after the incident, the man is reportedly in stable condition, with some weakened kidney function. Leslie Boyer, an anti-venom doctor at the University of Arizona VIPER Institute, warned against attempting to kill snakes, particularly by cutting them. "It's cruel to the animal and it leaves you with a smaller piece that's venomous to pick up," she told the Gizmodo news site.